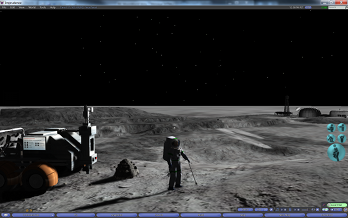 The developers behind the NASA-sponsored Classroom of the Future's MoonWorld project have become one of the first to effectively incorporate voice communication into the OpenSim virtual world. Since Dec. 1 MoonWorld has been available in OpenSim after first being created as an island in the Second Life virtual world. The migration to OpenSim was prompted by that world's ability to safely provide virtual islands to minors. Second Life does not allow minors under 16 and does not provide a protected environment for those over 16. However, a drawback of OpenSim was its inability to offer an affordable, noncommercial, usable alternative to the voice communication available in Second Life. That changed on Dec. 28 when VCOMM Solutions, a Swiss firm, released its Whisper software to the open source community, thus making it available for free to users. Soon after, Avatrian, the metaverse company developing MoonWorld for the center, was able to configure Whisper to work in MoonWorld. "OpenSim has been around a couple of years," said Dennis Bacsafra, CEO of Avatrian. "The issue that prevented migrating to it was the platform's lack of things and functions we're used to, for instance, voice over internet protocol, VOIP for short. That deficiency changed when Whisper was released. Communicating by voice with other users within the virtual world won't be an issue now." The voice function is important for the missions carried out within MoonWorld. Based on the Timocharis Crater on our own Moon, the virtual MoonWorld asks visitors to carry out a number of geological expeditions on the lunar surface. Via their avatars, visitors discover and interpret evidence gathered through sample collection, core analysis, and descriptive and measurement observation at 16 field stations. They also must manage the rations of oxygen they are provided in their spacesuits when they explore the crater. 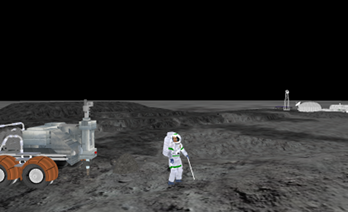 At left, the rover used to travel about MoonWorld. "The good thing about our being able to build VOIP into OpenSim is that it's applicable to other simulations within OpenSim," Bacsafra said. "Voice communication won't be a barrier now." Dr. Debbie Denise Reese, senior educational researcher at the Center for Educational Technologies, home of the Classroom of the Future program, pointed out that the development Avatrian has accomplished for MoonWorld helps lead others because "MoonWorld is a real state of the art instructional application in virtual worlds." "I don't think you can find anything as complex as MoonWorld in OpenSim or Second Life." Reese said players are always needed for MoonWorld. Because the mission is research based, players or their parents or guardians must complete a consent form to take part in the MoonWorld exploration. To learn more about scheduling a mission in MoonWorld, contact MoonWorld@cet.edu or telephone 304-243-2479 from 9:30 a.m. to 3 p.m. Eastern, Monday-Thursday.